Do you like our new look? Because we certainly do! Here at Cheshire Plumbers we’re constantly trying to give you the best customer experience and our new revamped appearance is our latest improvement. Our new website makes it even easier for you to contact us and find out more about our range of services. It also has a lot more information about our leak detection services – one of our most popular options. 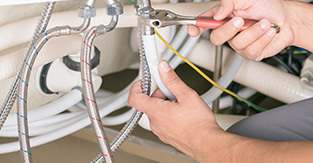 Cheshire Plumbers are an established plumbing and leak detection company located in Cheshire. We provide a wide range of services which includes thermal imaging, underfloor heating, solar heating, bathroom, gas and leak detection. Leak detection enables you to accurately detect leaks and issues with minimal disruption using cutting edge equipment such as thermal imaging to find the source of the leak without having to rip up floorboards etc. The smallest leak can cause maximum disruption, and ignoring it can just make the problem worse – instead we use our sensitive equipment to quickly find the problem. Our experienced team work with a range problems including pipe, underfloor heating and central heating leak detection. If you would like to find out more about plumbing our leak detection services then please get in touch with a member of our expert team. We work throughout the area and often work throughout the country for leak detection issues. You can be assured of expertise, reliability and affordable prices from Cheshire plumbers!